A Nite to Dismember is Nitehawk’s annual Halloween movie marathon, five back to back horror films played until the crack of dawn. For its second year, N2D features five of the best horror sequels ever made: Evil Dead II, The Bride of Frankenstein, Friday the 13th Part 2, and Return of the Living Dead. Below, Hatched editor Caryn Coleman (@caryn_coleman) discusses the night’s second film, The Bride of Frankenstein. James Whale had a knack for making horror literary staples like the creeping creaking house, demented scientist and classic monsters appear even darker on the cinema screen. 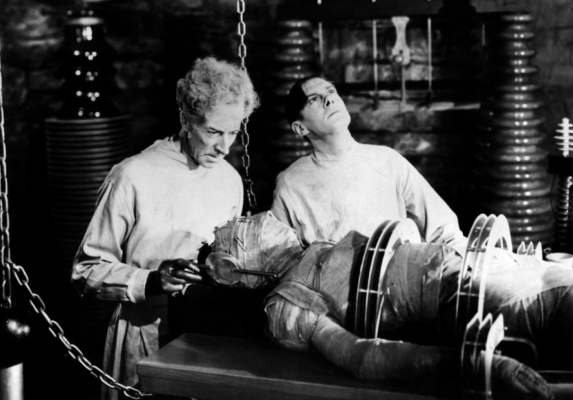 Although the first Frankenstein film was produced by Edison Studios in 1910, it’s Whale’s 1930 interpretation of Mary Shelley’s novel and Boris Karloff’s iconic portrayal that has become synonymous with our idea of Frankenstein’s monster. With its contrasts of shadows and light and humanization of the monster, Whale’s beautiful version endures as the quintessential moment Frankenstein’s creature was born in our popular culture. Five years after the release of Universal’s hit Frankenstein, Whale did the near impossible by making one of the best movie sequels in film history. The Bride of Frankenstein is a complex weaving of Shelley’s subtext of the moral implications scientific discovery produces along with Whale’s personal narrative of sexual preference by introducing one of film’s first homosexual character, Dr. Pretorious. It takes the small portion of Shelley’s original novel of the monster demanding Dr. Frankenstein produce a female friend for him (which the doctor declines to disastrous consequences) and re-imagines it by having a certifiably mad scientist, Pretorious, blackmail Frankenstein into furthering his living dead creations. Whale boldly kicks things off by visualizing Shelley’s prologue in which she recounts the dark and stormy night she shares her monstrous story with husband Percy Shelley and Lord Byron. This melding of literary history as a launching pad for another re-imagining of the written source is risky move (for starters, she confides that the monster survived) but it works simply because it’s damn well crafted. From this scene, Whale’s celluloid tale of a ‘new world of gods and monsters’ opens up and we’re left with more imagery that solidifies the ever-evolving Frankenstein cultural legacy. Karloff again wholeheartedly embraces his role and makes the monster ever more human and in desperate need for companionship while the bride herself, who is only in the film for mere moments, has become iconic with her electric shocked white-striped hair (played by Elsa Lanchester who is also Mary Wollstonecraft Shelley in the film). 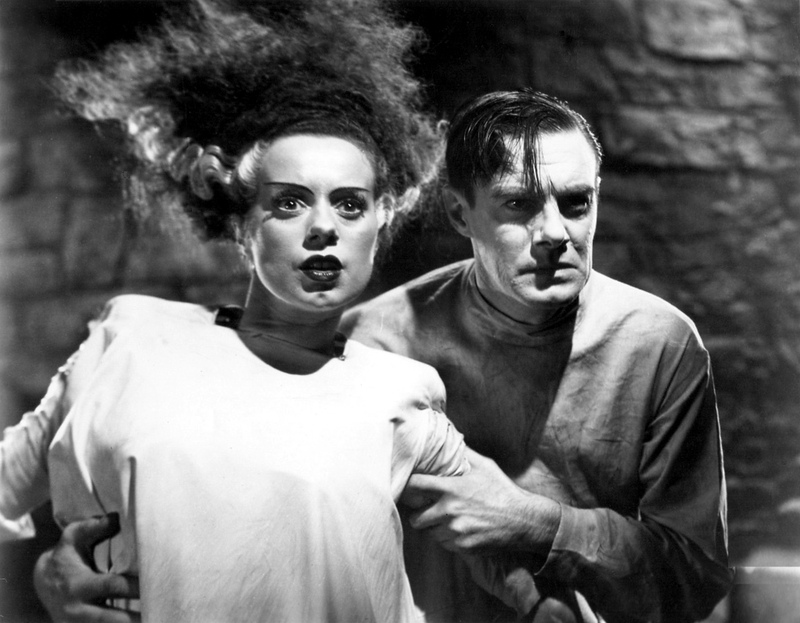 If sequels have become synonymous with commercial capitalization, cheesy storylines, and subpar acting then consider The Bride of Frankenstein as one of the rare exceptions along with The Godfather: Part 2, The Empire Strikes Back and Dawn of the Dead. As Frankenstein’s monster continues to be emblematic of the ultimate outsider and commentary on the dangers of scientific meddling, Whale’s Frankenstein and The Bride of Frankenstein endures not only as classic films but as poignant films and, best of all, still very disturbing.